A seasonal allergy is an allergic reaction to a trigger that is typically only present for part of the year, such as spring or fall. This type of allergy refers to a pollen allergy, such as trees, weeds, and grasses. Perennial allergies, on the other hand, are usually present year-round and include allergens such as pet dander and house dust mite. 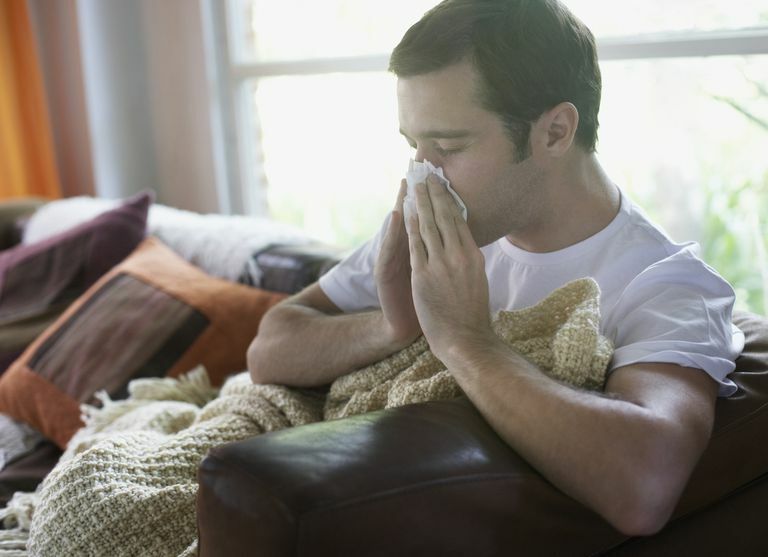 Molds can be a seasonal or perennial allergy trigger. Seasonal allergies are also often referred to as hay fever. Symptoms of seasonal allergies include sneezing, runny nose, nasal congestion, itching of the nose, and post-nasal drip. Not all people experience all of the symptoms of hay fever, and in some people, only one symptom will predominate. It may be difficult to tell the difference between seasonal allergies and the common cold, and only an allergist may be able to tell the difference. Learn about the ways to tell the difference between colds and seasonal allergies. Pollens are tiny, egg-shaped powdery grains released from flowering plants, which are carried by the wind or insects and serve to cross-pollinate other plants of the same type for reproductive purposes. When pollen is present in the air, it can land in a person’s eyes, nose, lungs, and skin to set up an allergic reaction. Symptoms may include allergic rhinitis (hay fever), allergic conjunctivitis (eye allergies), and allergic asthma. Pollens that are spread by the wind are usually the main cause of seasonal allergies, while pollens that rely on insects (such as the honeybee) to be carried to other plants do not. Most plants with bright, vibrant flowers (such as roses) are insect-pollinated and do not generally cause seasonal allergies since the pollen is not usually present in the air. Pollen can travel long distances and the levels in the air can vary from day to day. The pollen level can be quite different in various areas of a particular city or region. Levels of pollen tend to be highest from early morning to mid-morning, from 5 a.m. to 10 a.m. Avoidance of pollen can be difficult but is theoretically possible. Spring allergies are a result of pollen from trees, which can start pollinating anytime from January to April, depending on the climate and location. Trees that are known to cause severe allergies include oak, olive, elm, birch, ash, hickory, poplar, sycamore, maple, cypress, and walnut. In certain areas of the world, some weeds will also pollinate in the springtime. Grass pollen is typically the main cause of late spring and early summer allergies. Grass pollen is highest at these times, although grass may cause allergies through much of the year if someone is mowing the lawn or lying in the grass. Contact with grass can result in itching and hives in people who are allergic to grass pollen; this is called contact urticaria. Grasses can be divided into two major classes—northern and southern grasses. Northern grasses are common in colder climates and include timothy, rye, orchard, sweet vernal, red top, and blue grasses. Southern grasses are present in warmer climates, with Bermuda grass being the major grass in this category. Learn about all of the ways that grass can cause seasonal allergies. Weed pollen is the main cause of seasonal fall allergies in the late summer and early fall. Depending on the area of North America, these weeds include ragweed, sagebrush, pigweed, tumbleweed (Russian thistle) and cocklebur. In certain areas of the world, some trees can pollinate in the fall as well. In most areas, pollen is measured and counted, with the different types of pollen identified. This may be reported in terms of trees, weeds, and grasses, or may be further divided into the types of trees and weeds identified. Specific grasses are not usually identified on pollen counts, as grasses look the same under a microscope. Find out the pollen counts and types of pollen currently found in your local area. An allergist can help determine if you have seasonal allergies and the types of pollen to which you are allergic. This is accomplished through allergy testing, which typically involves skin testing or a blood test (RAST). Allergy testing can be helpful in predicting the times of the year that you are likely to experience allergy symptoms and is needed if you are interested in taking allergy shots. Keep windows closed to prevent pollen from drifting into your home. Minimize early morning activity when pollen is usually emitted – between 5 and 10 a.m.
Keep your car windows closed when traveling. Stay indoors when the pollen count is reported to be high, and on windy days when pollen may be present in higher amounts in the air. Take a vacation during the height of the pollen season to a more pollen-free area, such as the beach or sea. Avoid mowing the lawn and freshly cut grass. Machine-dry bedding and clothing. Pollen may collect in laundry if it is hung outside to dry. Why Would You Get an Allergy During the Summer? Do You Take an Antihistamine for Your Nasal Allergies?